Enhancing form and depicting surface, texture, materials and cast shadows. 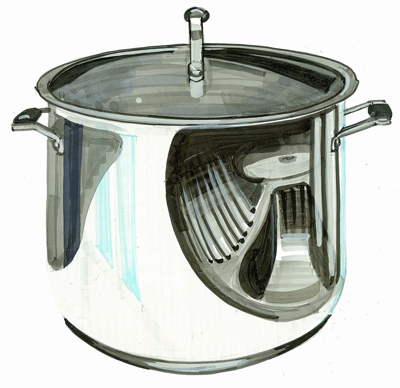 Rendering is a process where designers and illustrators enhance the surface of their artwork. Three dimensional rendering relies of conventions of visual literacy. When we see 2d things rendered effectively - we interpret them as 3d pictures. 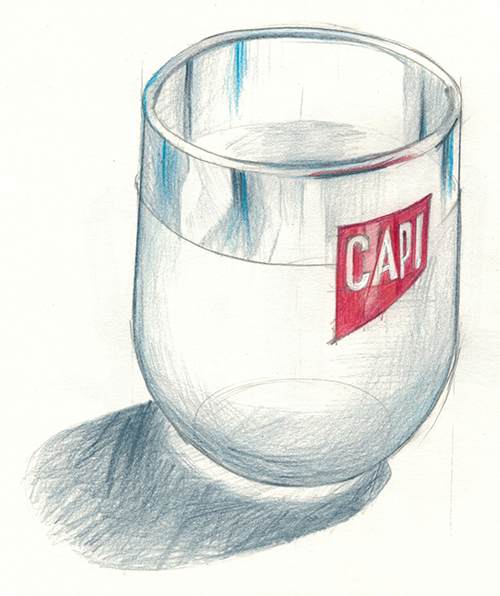 We believe in the effect of depth so strongly, we refer to such drawings as three dimensional. 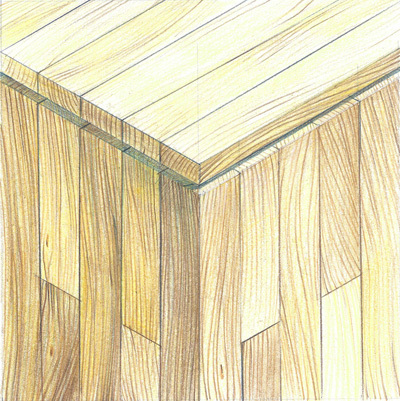 There are many ways to create the effect of three dimensions on paper. Some of these include; the use of scale, overlapping objects, line, angles and colours. 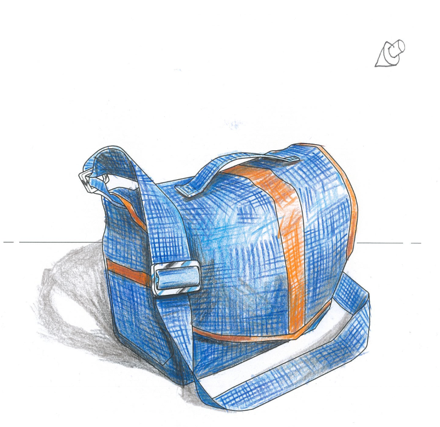 However, designers usually enhance their drawing and develop form with the application of tone. 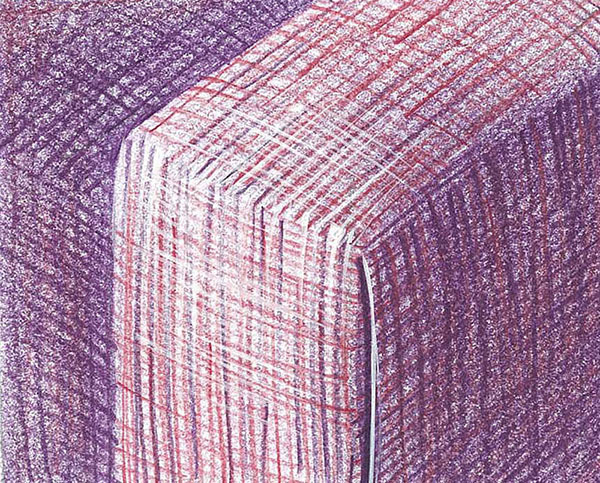 The variation of tone on different parts of a drawing creates the effect of light falling on an object. When people write a story they use literacy. They use words; verbs, adjectives, nouns, etc. When they tell that story, they tell it using language methods people are familiar with. Writers use different conventions for different kinds of writing. In the same way, when we use visual literacy to represent an object or a building, we need to use visual conventions to create a picture in a particular way. 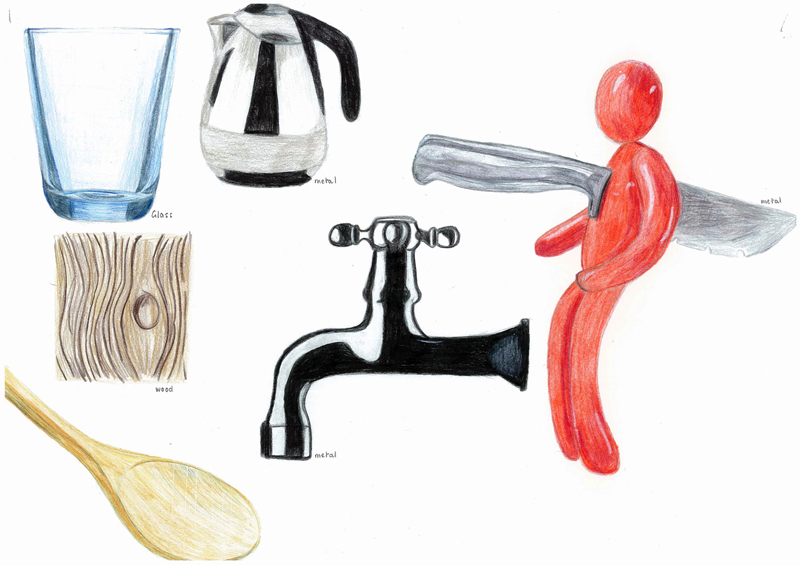 The components of visual literacy for rendering include shape, colour, line, form, tone and texture. In the same way as an author uses literacy consistently, we must use visual conventions people find easy to understand. This means there is a light source on an object, that the light source is above and that shades of various colour or tonal depth, darken as they progress further from the light source. It is important for us to use conventions correctly to enable us to tell a realistic story about an object. 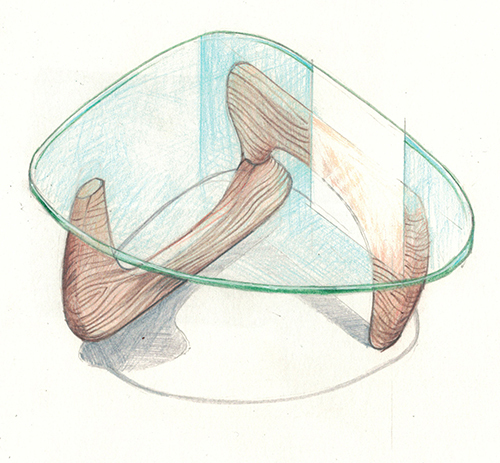 In this way our audience will read our drawing correctly and see objects in three dimensions, as intended. By contrast, not all people tell a story in the same way. Some people make jokes. The artist Pablo Picasso was famous for confusing viewers with his paintings. He used colours in a background that would leap forward yet soft pale colours in the foreground that should fade into the distance. This was for a good reason. Picasso wanted us to see familiar things differently. He wanted to ignite our imagination. 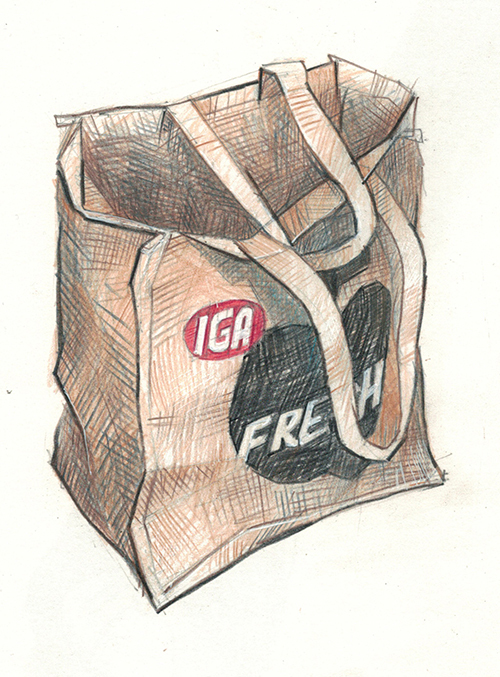 However, our job as illustrators is to create a realistic representations of things. 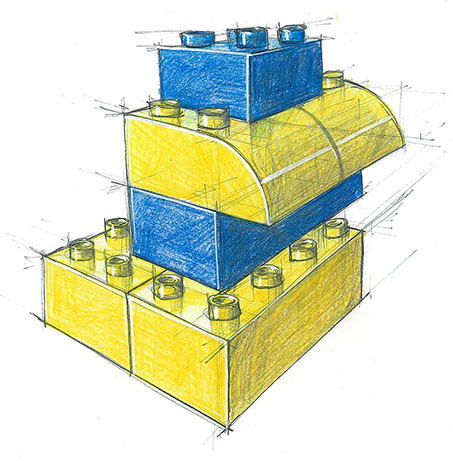 This chapter will show you how to create three dimensional representations. 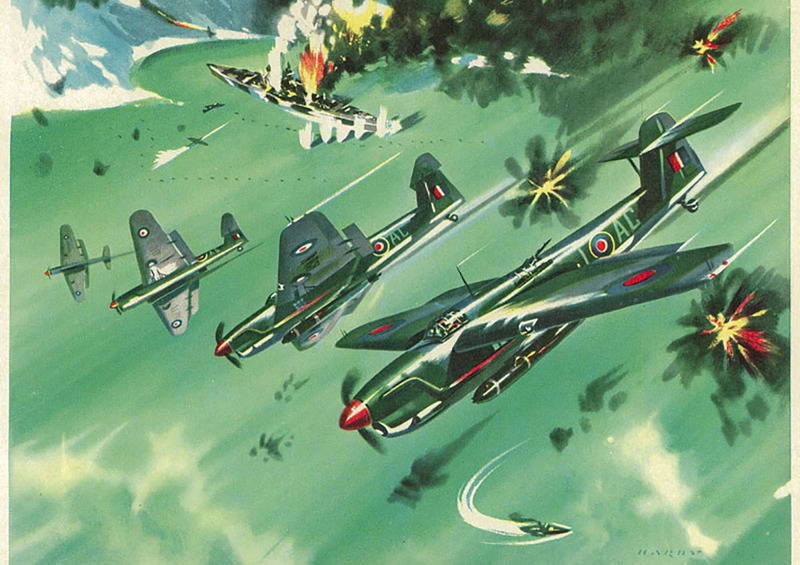 An amazing water colour illustration on aircraft by Wilf Hardy, Eagle Annual, 1963. 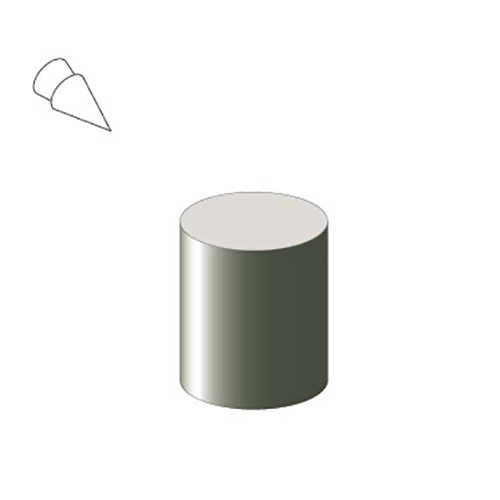 Form is the name given to a 3 dimensional shape. 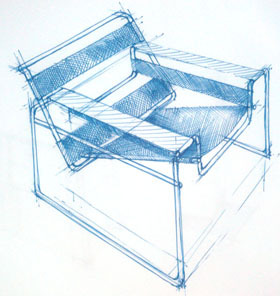 A form can be created by angled lines or shapes but when we draw forms with line alone, they lack reality. Forms in real life are seen with different tones of their base colour as the light falls across their surface. In this first section we will deal with how to render to enhance form alone. In part one of interpreting light source we will investigate enhancing form without 'cast' shadows. Before we begin shading an object we must be aware of the location and direction of the light source. It is customary to work with a light source positioned above an object. In addition, the light source may be in front of the object (our side of the object) or behind. 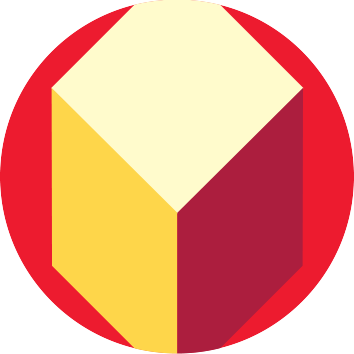 The position will greatly effect the way it is shaded. 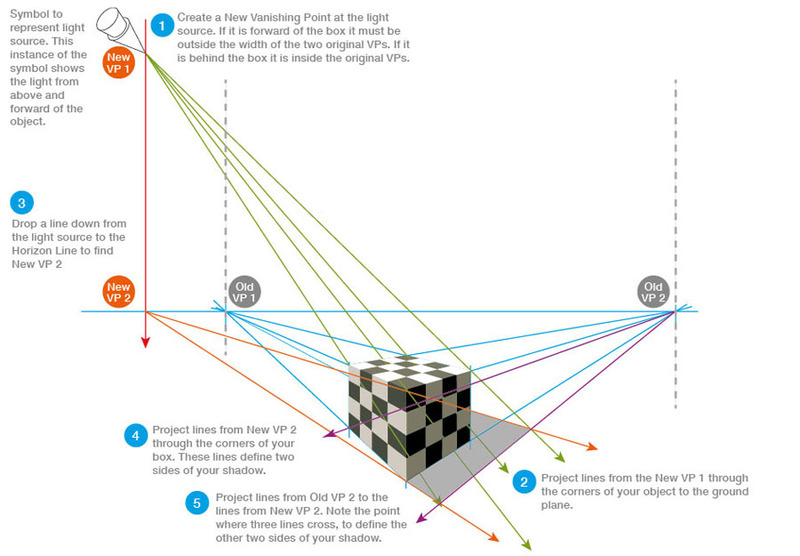 Before you render, make sure you have a clear idea about where the light source is. Look carefully at the images below. Look carefully also at the way the light source symbol. 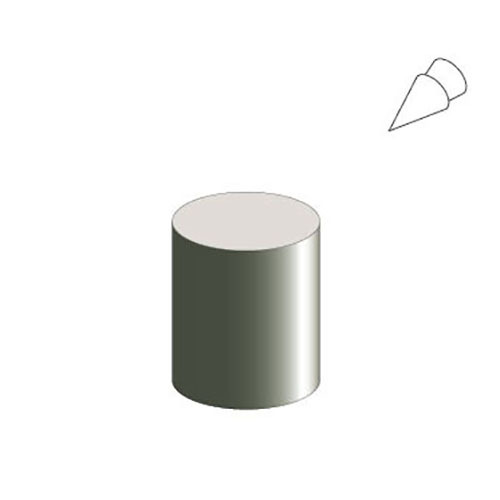 A light source in front and to the left of the object. A light source in front and to the right of the object. A light source behind and to the left of the object. An illustrator's keyboard. 10 evenly spaced tones from white to black. The first stage of rendering is shading. But what shades should I use? Consider the image above. I have created then even tones ranging from white to black. Let's say we give these numbers. Call white 0 and black 10. All the steps in between are 1 - 9. 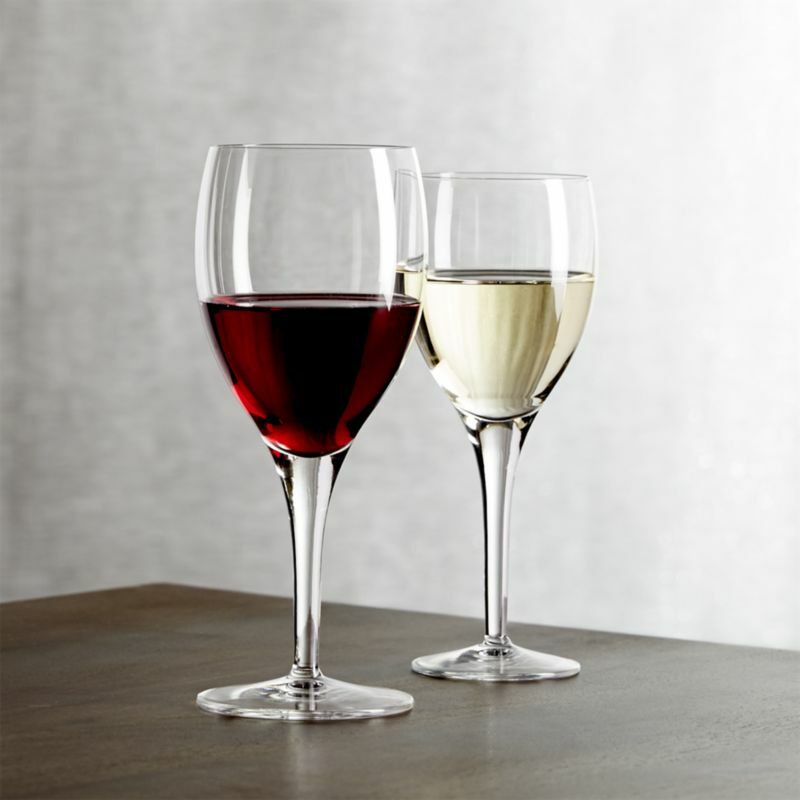 This is our tonal range. 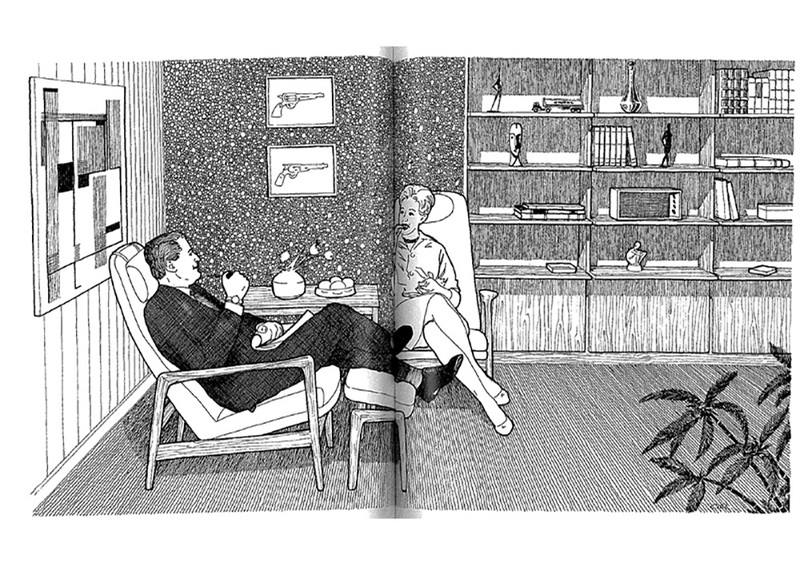 We have ten different tones to use on any black and white illustration. 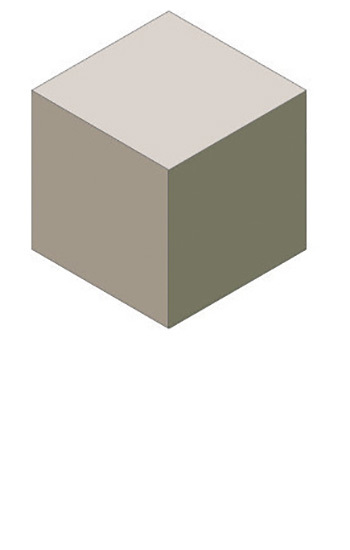 A cube's form is enhanced with three flat planes of different tones. Use a light, a medium, and a dark tone. 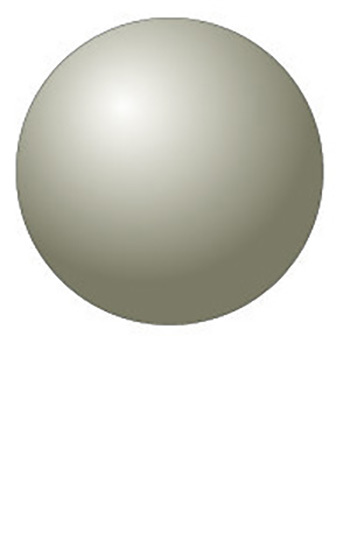 A sphere's form is described by the same three tones in an evenly blended gradient in both axis. This is called a 'radial' gradient. In a radial gradient the tones blend in both directions - vertical and horizontal. Look at the three images of geometric forms above. How have the tones been applied? 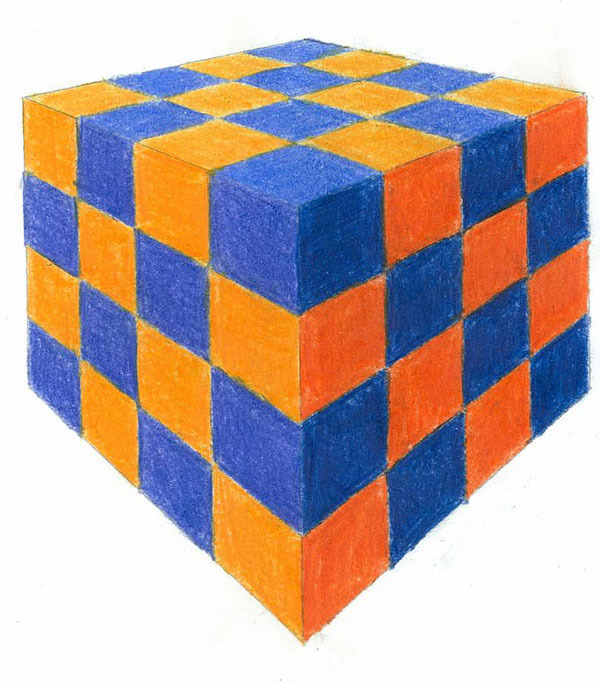 If the cube has a light, a dark and a medium tone, what number tones would you say have been used on each plane? 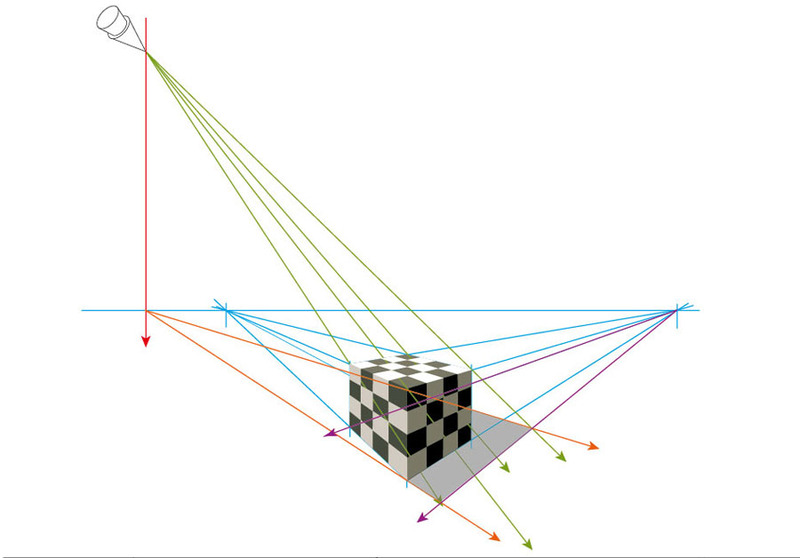 Examine which forms use flat planes of tone, which uses blends in one plane (a linear gradient) and which uses a consistent blend in all planes (radial gradient). Make a line drawing of each of the forms above. Shade them to practice creating light, medium and dark tones, then smooth gradients. What sort of pencil should I use? 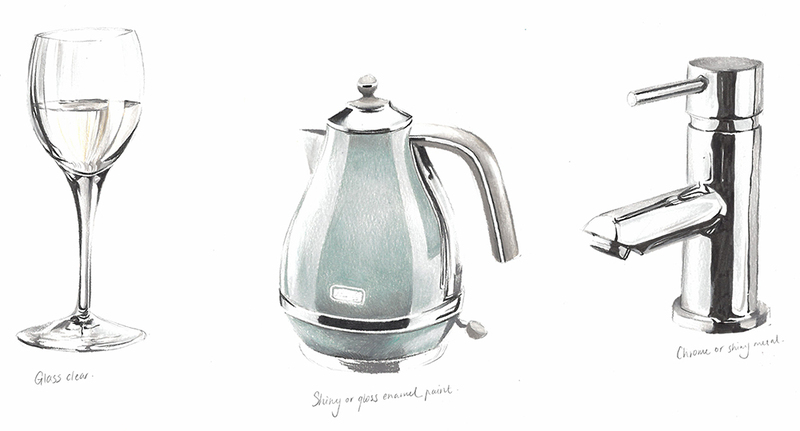 For each of the rendering exercises use a 2H or HB pencil for the outlines, then shade using a 2B pencil. Keep it sharp to work up to your lines accurately. When we render to enhance form alone we do this without respect for what colour an object is. We just apply light, medium and dark tones to a surface. But there must be more to it? 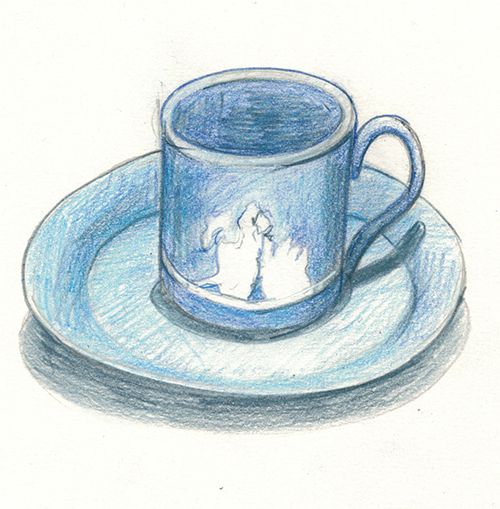 How can we to apply tonal graduations with respect for the colour of objects we are rendering? 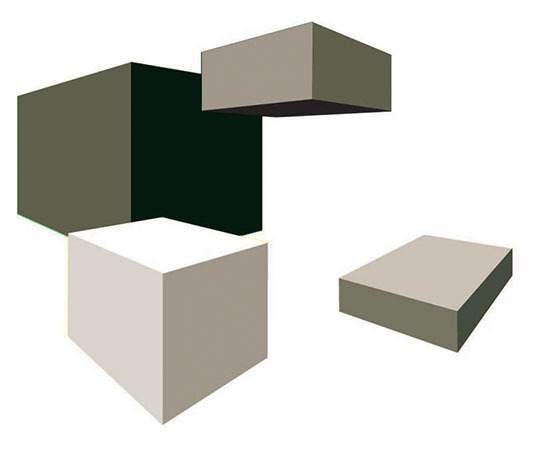 Each of these rectangular prisms is rendered with a light, medium and dark tone, but they are all rendered with a slightly different group of three tones. This is done to represent different colours for each form. 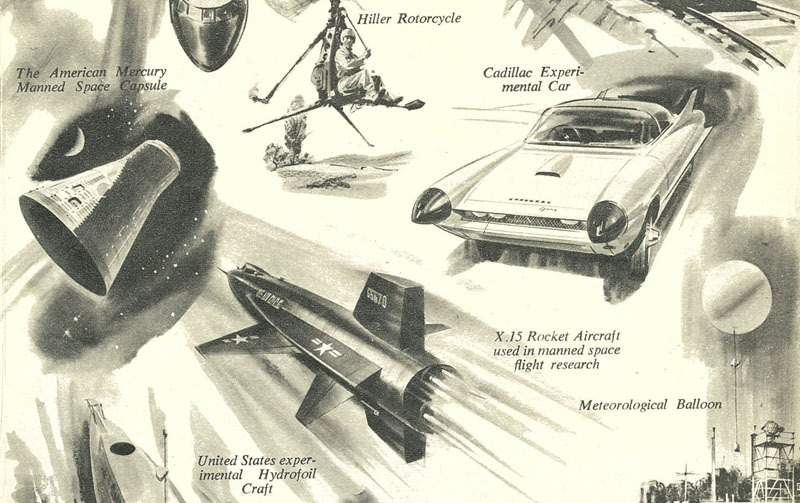 Here is another fabulous water colour illustration of transport vehicles by Wilf Hardy, Eagle Annual, 1963. 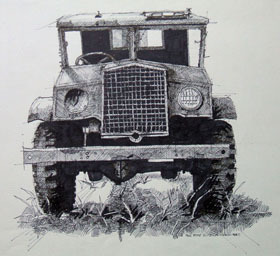 Can you see how he has rendered the white car and the black rocket with a different range of tones? 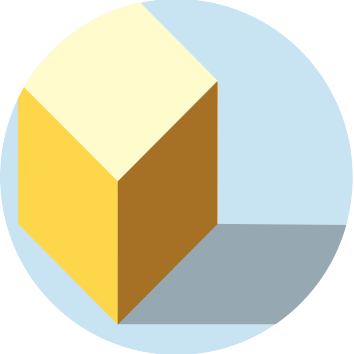 Make a line drawing of a group of boxes like the one above. 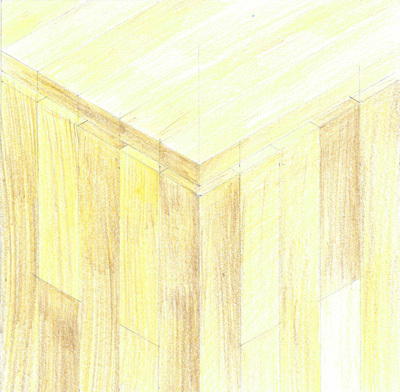 (Use 2 point perspective or isometric). Shade them to represent different colours of boxes in the same way as shown. Remember to use light groups of light, medium and dark then dark groups of light, medium and dark tones. Now we have an understanding of how to enhance for with tone and how to choose tones correctly to represent colours, let's try it in real colour. Remember, what you have learnt with tone still applies with colour. 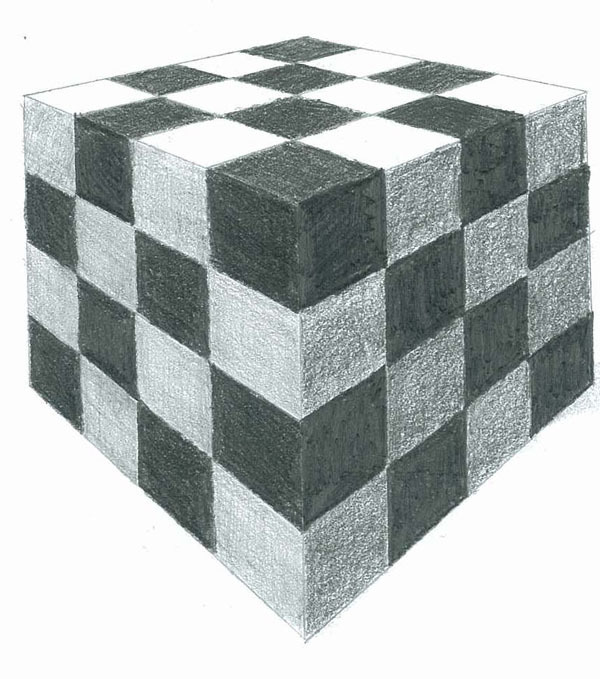 In these two fine examples, A Year 11 student has shown the checker board box in two ways. She has developed light, medium and dark tones to represent two different, contrasting colours. This time represent either a group of boxes (like the ones above) or one box with different colours on it, in colour. The challenge is to create light, medium and dark tones for each colour. Look at this wonderful rendering of a World War II bomber the 'Mosquito' by Rykyu Watanabe, 1981. Can you see evidence of different groups of tones used to represent different colours? 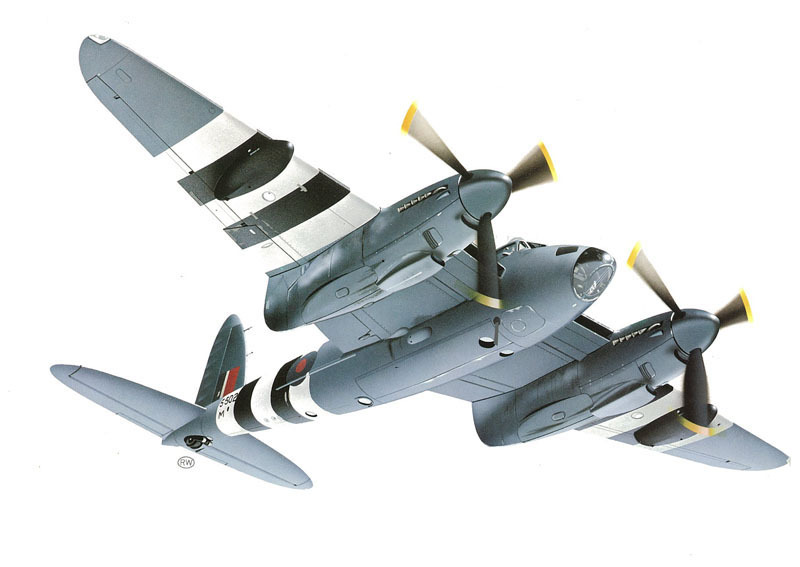 Note the way the black and white stripes wrap around the grey in the main body of the plane. Now that we have learnt how to enhance form with shade we need to turn our attention to representing the surface of objects. Different materials have their own visual characters. In this section you will learn how to depict a range of hard, soft, opaque and transparent materials for visualisation, presentation drawings and examinations. What materials will I need to render? 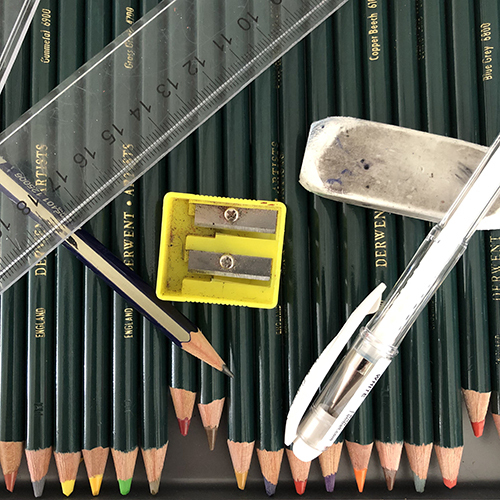 In Visual Communication Design you will have to be able to render many surfaces - both for your practical work and for the examination at the end of Year 12. 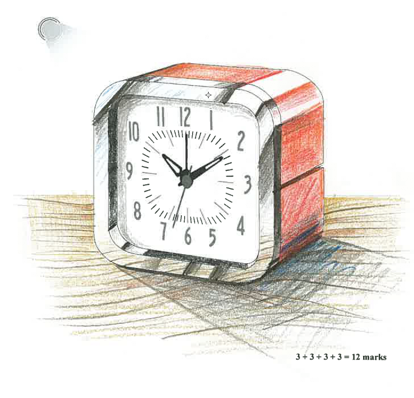 Firstly, learn how to be able to create them in two dimensional in 'swatches' then move onto three dimensional examples. Let's take them one by one. You need to master all of these. 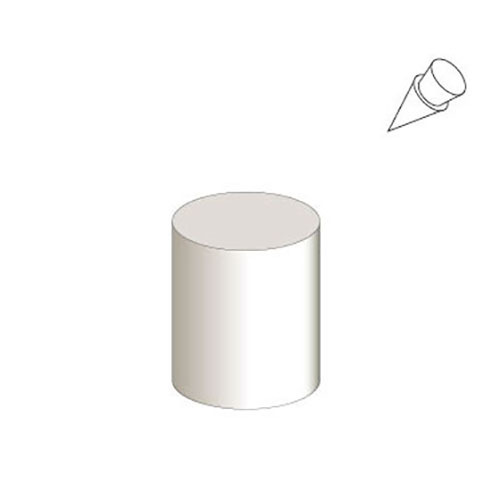 Below are images of objects bearing all of the surfaces you need to master in VCD. HOW REAL CAN it be? Rendering surface texture and sheen gives ultimate realism to your work. 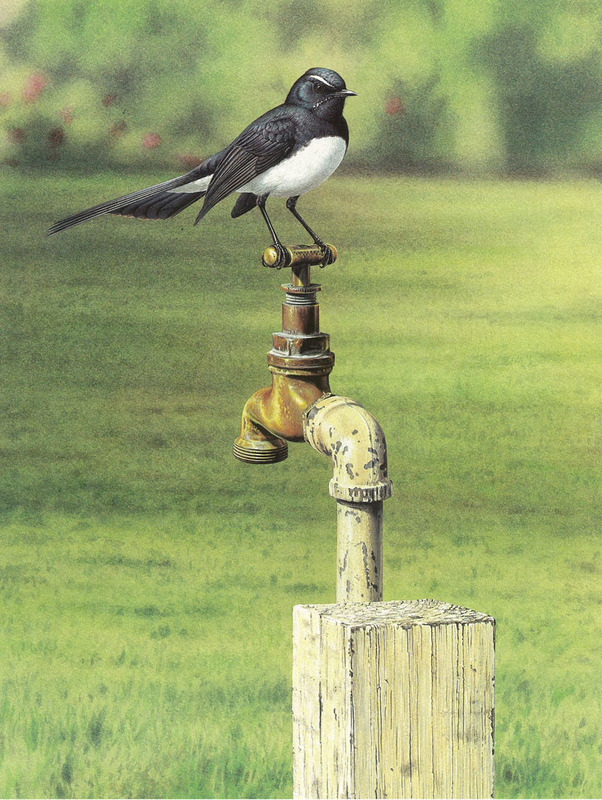 This amazing watercolour image of a Willie Wagtail is by illustrator Peter Trusler. (Birds of Australian Gardens, Koot, McCulloch, Trusler, Rigby, 1980, p101). 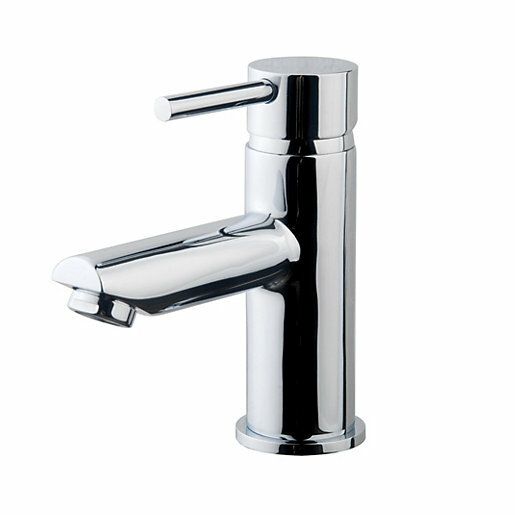 Satin or brushed aluminium metal. Also shows satin or matte plastic. Gloss or shiny plastic. Also shows satin metal. 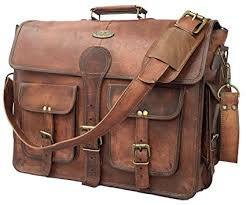 Each rendering technique you learn should be based on observational drawing of real objects and their textures. It seldom works to copy the techniques of professional illustrators as you will not be representing textures, you will be representing other people's representations of textures. 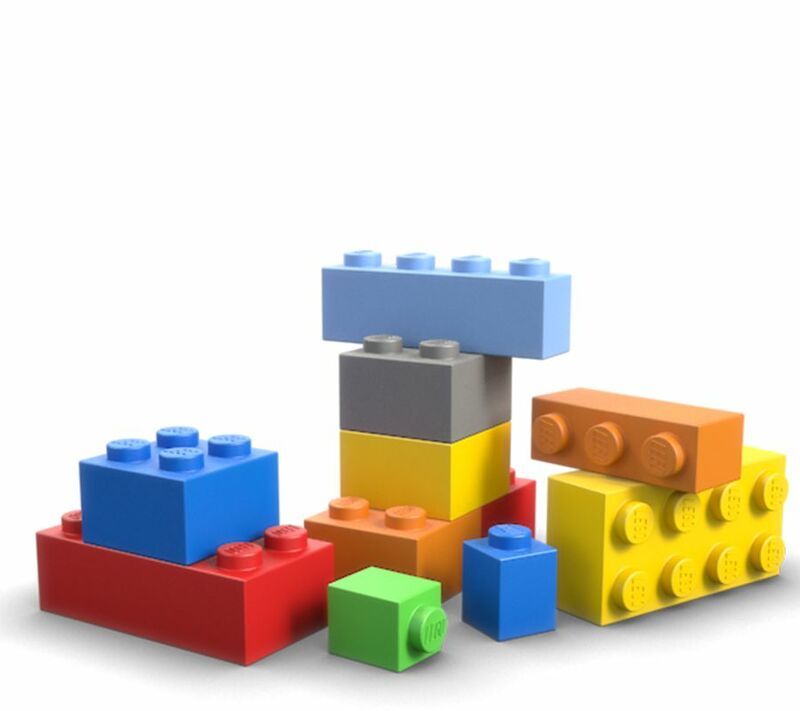 Your work will lack structure. The techniques on this page are not designed to make you an artist, nor to help you create original art work that offers an original perspective on the world. 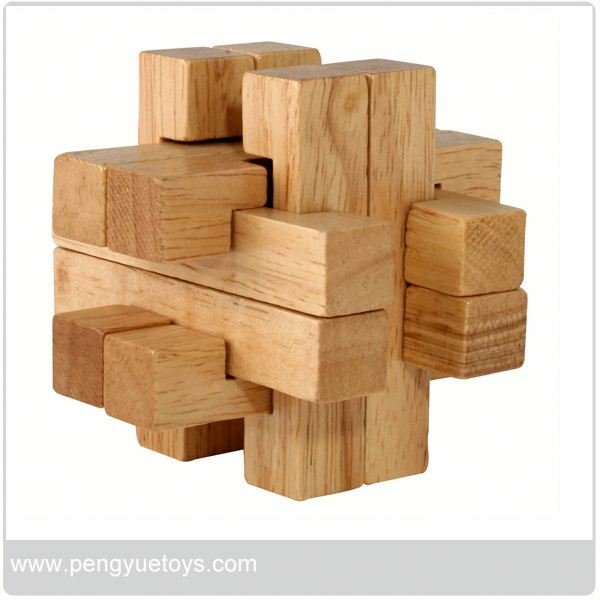 By contrast, they are meant to help you to produce symbolic representations of surfaces. They are not true artistic interpretations of life, but short cuts to making your drawings realistic. 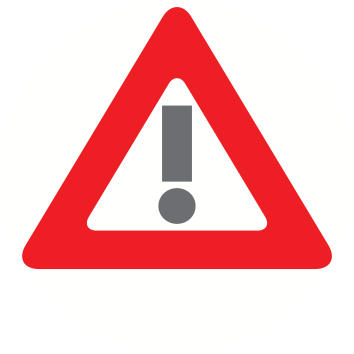 Therefore, reference professional illustrations, but don't copy them. In most cases rendering any textured surface involves a three step process. This applies to most materials. Finally, add further shades or details or highlights with white pencil or paint on a fine brush. Two examples of the process. The two examples below show how to lay down a base tonal texture first then add marks to represent the actual texture. The final detail stage has also been done over the second image in each pair. First, put down your light, medium and dark tones to block in your form. Next, go over the form with lines to represent the texture. Finish off with some white painted details. 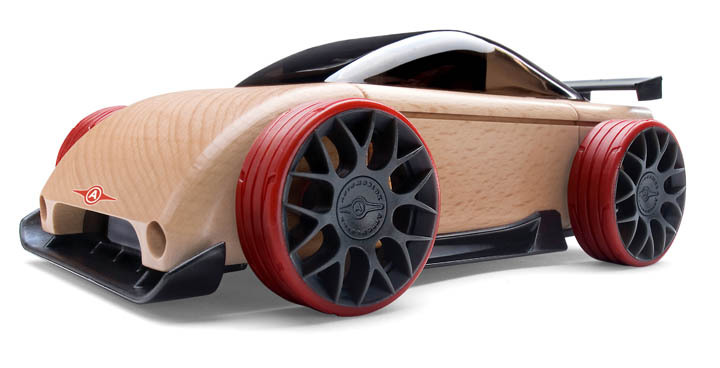 For wood grain. First, put down your base tones; light, medium and dark. As an extension, I made different 'planks' with slightly different shades of my base colour. Next, go over the form with lines to represent the texture. Finish off with some really sharp dark lines to emphasise the boards. Take a look through the images below to see how to render each of the materials listed above in coloured pencils (and markers in some cases). 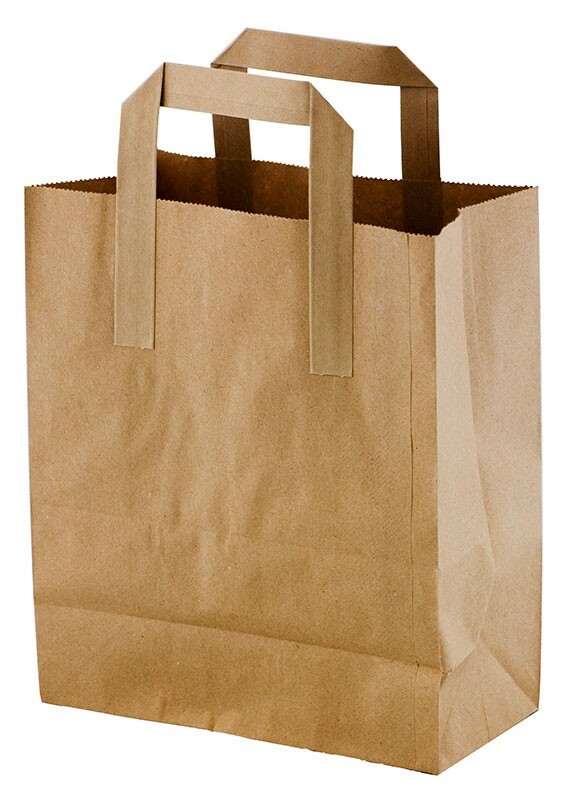 A recyclable shopping bag has a rich fabric texture and muted highlights. 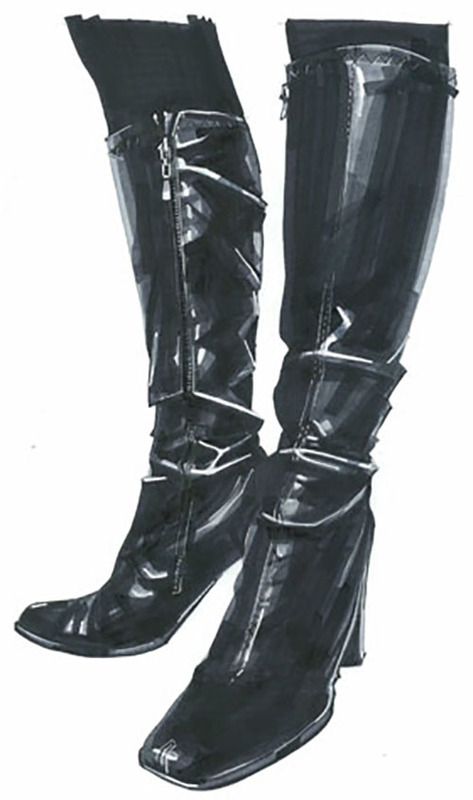 Here is a marker rendering of a pair of shiny black leather boots. I worked it up with greys, leaving gaps for the paper to show through. Finally, I finished with some white paint. Note, on shiny surfaces you get real deep shadows and very bright highlights. 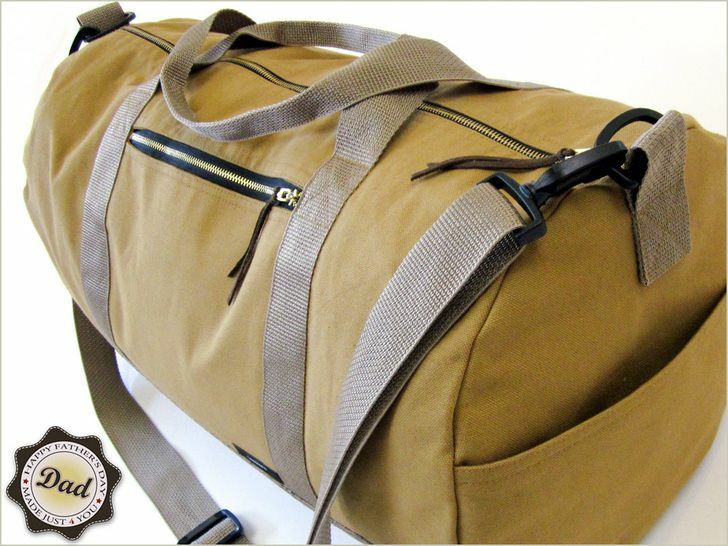 A VCAA exam image of a cloth bag with contrasting straps and shiny buckles. Always work up base tones first, then add texture. 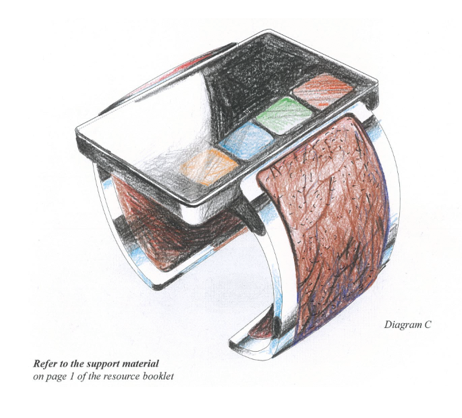 A VCV trial exam image of a digital watch with glass face and leather insert on chrome band. Note, the areas I left white to emphasise shiny materials like glass and chrome. Wood grain seen on this beautiful old B&O speaker from 1979. 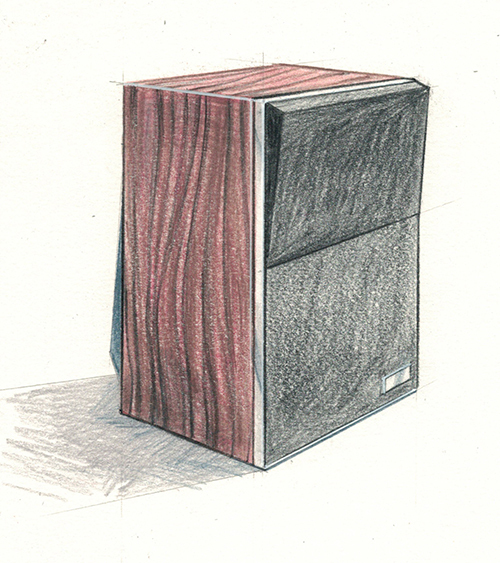 A rich red rosewood veneer with aluminium detail strip. 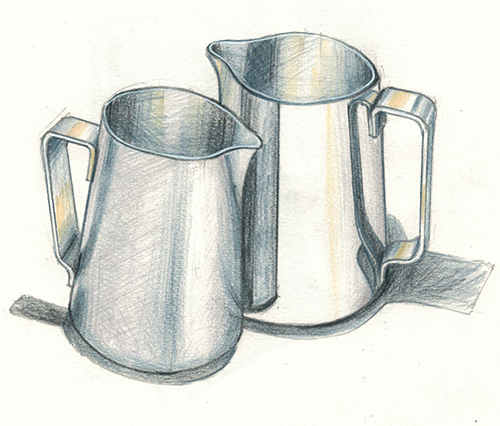 Two milk stainless steel milk jugs in different finishes. 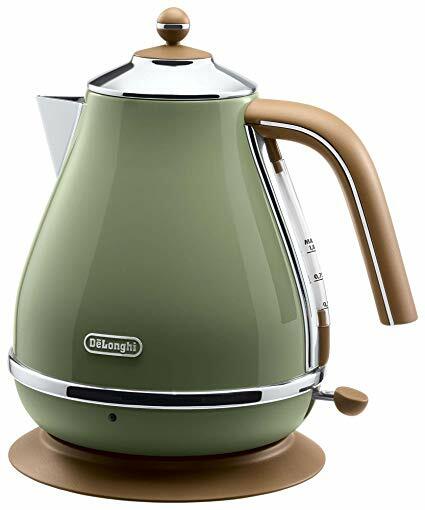 A satin metal one sits in front of a polished stainless steel jug. 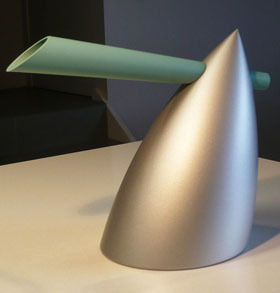 Note, the difference in the reflections, highlights and shadows between the two finishes. Shiny metal. This material shows the highest contrasts of light and dark tones. 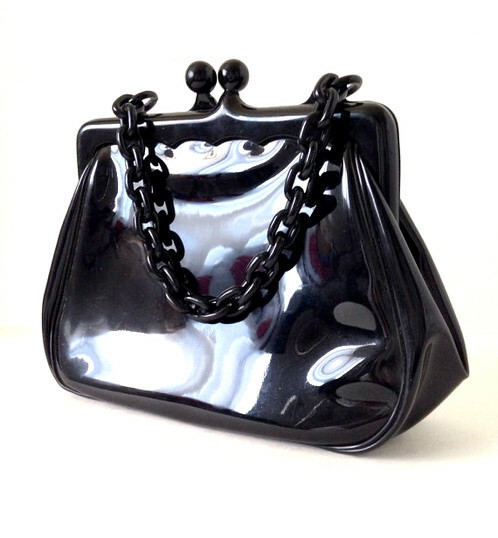 Satin plastic. 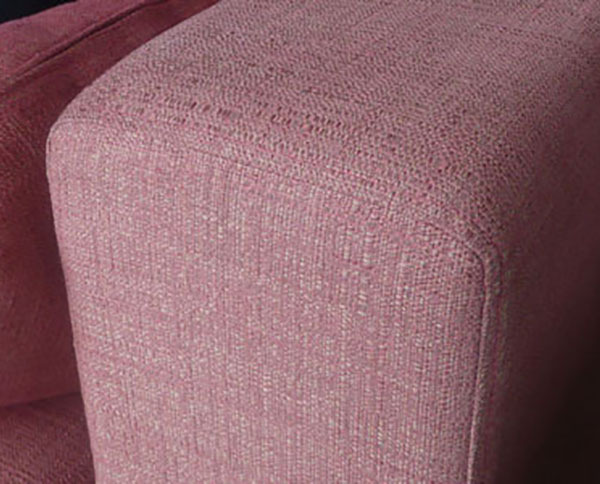 Satin plastic has subtle highlights and shades yet reflects some light on the upper surfaces. Gloss or shiny plastic. A VCV trial exam image calling for shiny chrome and plastic. 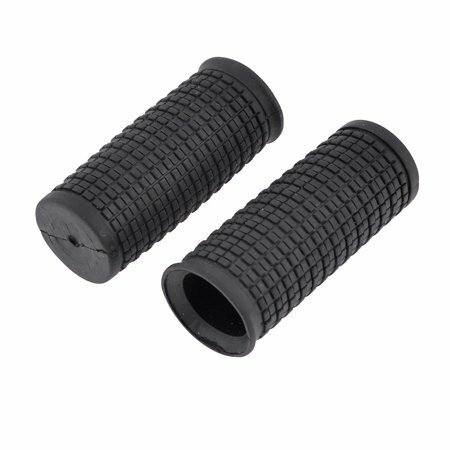 Textured rubber shown on the grip on this large torch. Note the ways the light falls and the difference between the highlights generated on the anodised aluminium body of the torch and the rubber grip and front end. Gloss enamel or paint surface. 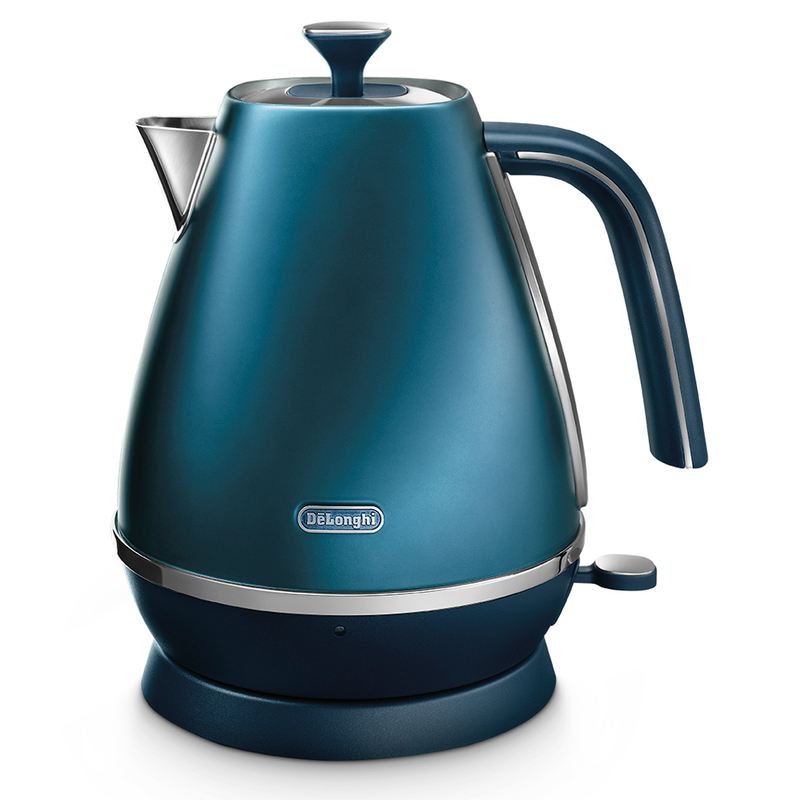 In fact any shiny surface will render the brightest reflective highlights and deepest shades. This Japanese lacquer bowl has a high polish and reflects light from nearby windows. 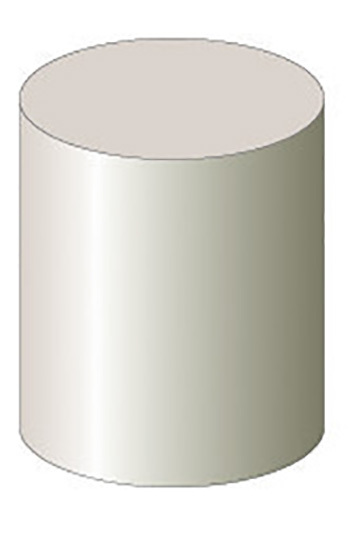 Matte surface renders dull highlights and soft shadows. 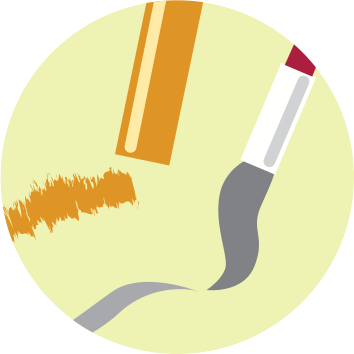 Matte or flat will require the least contrast from highlights to shadows to render. 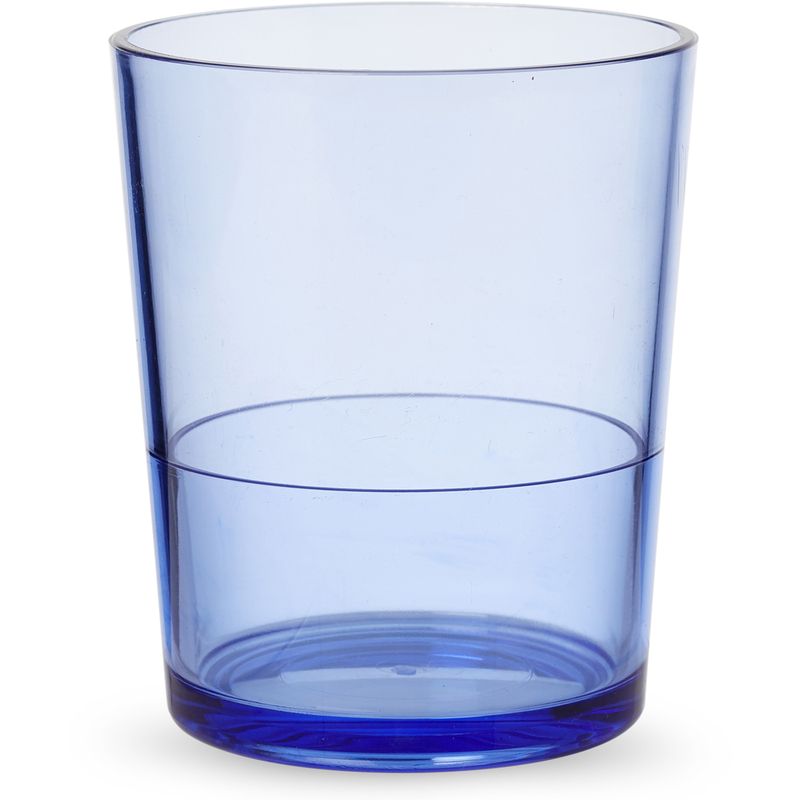 A drinking glass. The top half is clear and the bottom half is frosted. Clearly shows how reflections and highlights fall on the two surfaces. 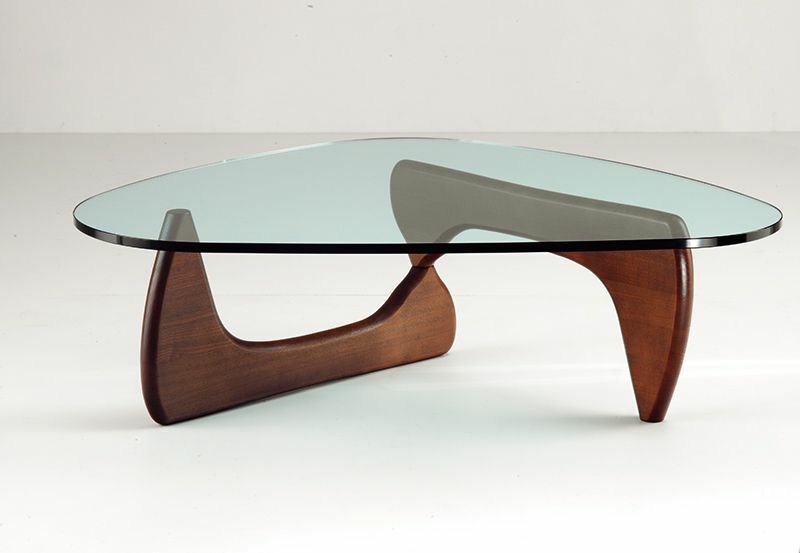 Flat glass coffee table. The thing is with glass, it is transparent so in order to show it, shade it lightly acqua and generate some bright reflections as if coming from a window above. Translucent plastic cover. This bike tail light makes a complex subject to render a coloured see through plastic cover. Go around your house and choose objects bearing of each of the surfaces in this section then make a surface sampler page like the one here. Try them all, you can never be sure which ones you will be required to show in your exam. Try making one of these sampler pages before you go into an exam. This is your best training. No seriously, take a look at this group by student Alana Lacy. Did you really think colour pencils can work like this? Try it for yourself. 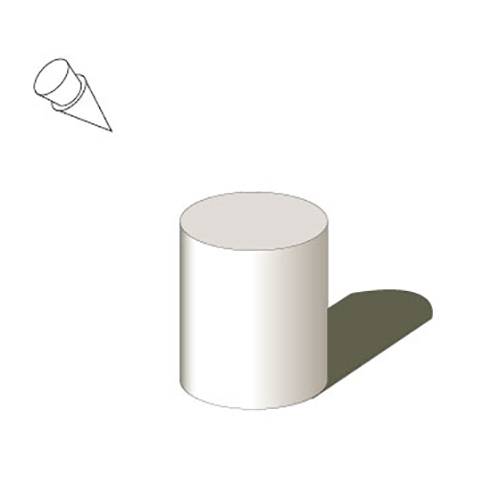 Before we begin rendering shadows cast from object we must be aware of the location and direction of the light source. 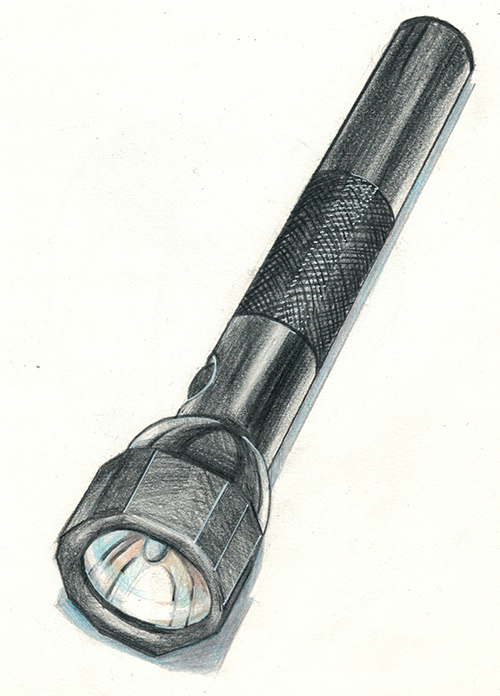 It is customary to work with a light source positioned above an object. However, in addition, the light source may be in front of the object (our side of the object) or behind. This position will greatly effect the way it is shaded. Before you render, make sure you have a clear idea about where the light source is. Look carefully at the images below. Look carefully also, at the way the light source symbol is shown. The difference in this section is that the cast shadow will be shown. 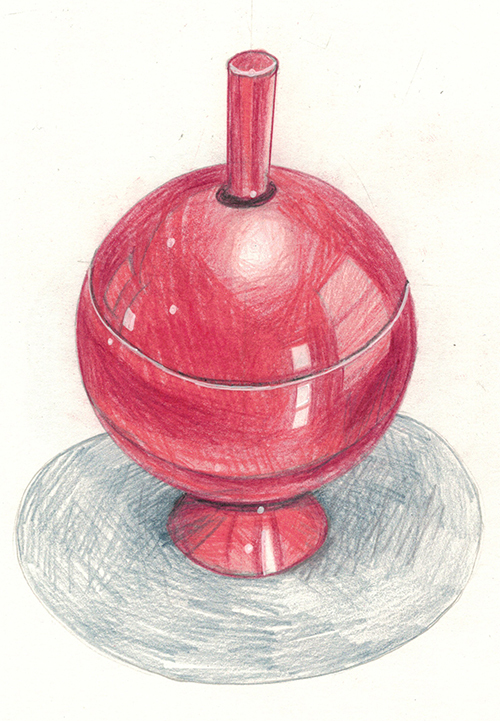 Create shade to emphasise the form of an object = make gradients in tone on (and only on) the surface of the object. Just describe the light as it falls over the object's surface. 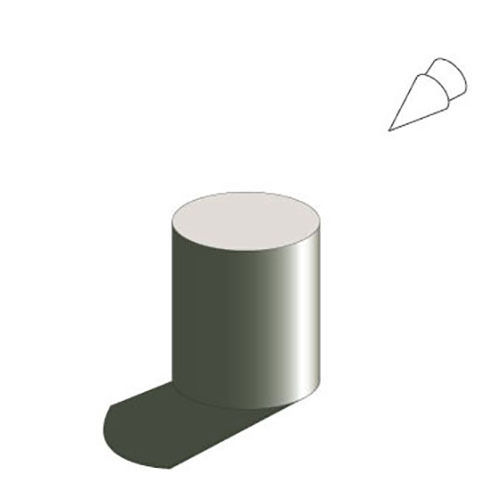 Render or create cast shadows = create a translucent shade (light grey you can sort of see through) that results from the light passing over, either protrusions on the object or the object itself, and are drawn either on the object or the ground. The purpose of this section is to discuss number 2 - cast shadows, that is shade that is cast by objects. It is a pretty difficult science to work out the precise position of cast shadows in a perspective drawing. If you really, really want to work them out you will need to refer to books on the subject. Alternatively, Google it. 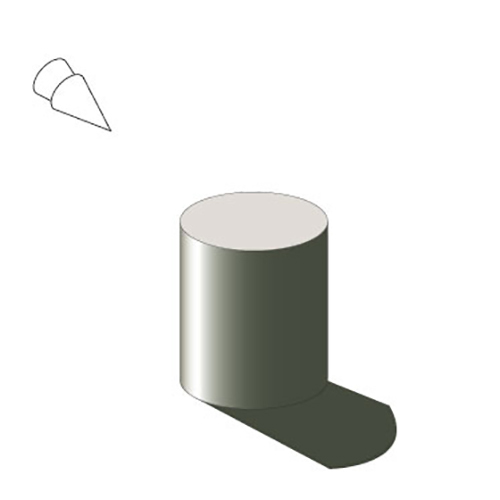 Just as there are books on how to construct accurate, measured perspective projections, the same can be done with cast shadows. 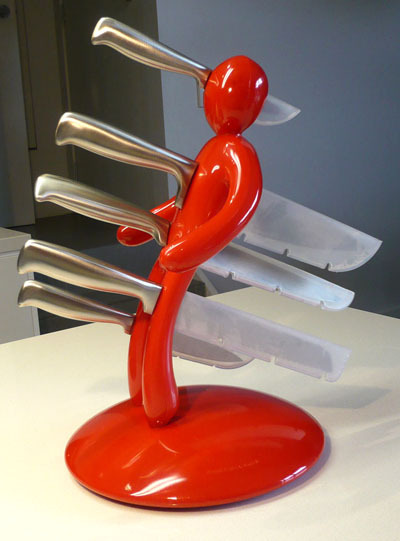 However, I will show a simple and effective method. What we need to know as students, is the basic concept of cast shadows. We need to know approximately how and where to draw them and more importantly how to align the sides of the shaded area. I have constructed a very basic illustration of this process. Read the steps below, then try it for yourself. Find out more information in order to try it on more complex examples. 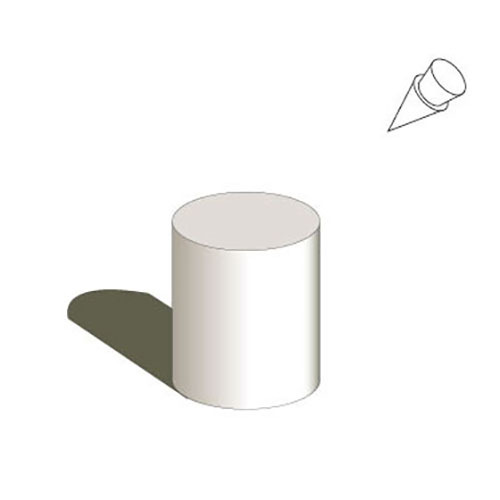 A cast shadow formed by a light source and additional Vanishing Points. Look below for details on how. 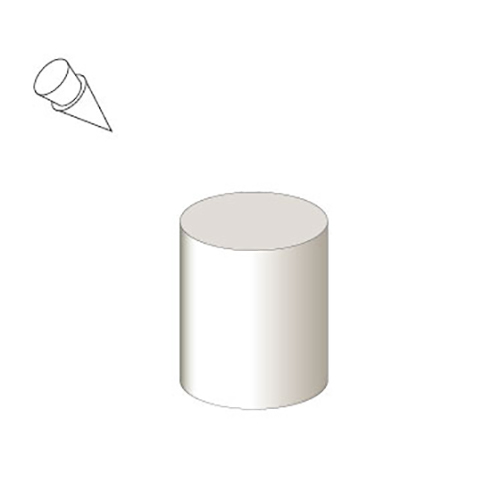 Follow these steps to create cast shadows on any drawing. As I said, this is only a simplified version of the process, but if you can gain an understanding of it, you will be able to apply it to any drawing. 1 - Make a copy of the box drawing above. 2 - Make sure the light source is at point inside the Old Vanishing Points (this will approximate a light source behind the object with the shadow coming forward). This will create a cast shadow. 3 - For further practise, try moving the light source up and down, see what causes the shadow to be longer or shorter. 4 - Try it on a more complex sketched object like a car. WHAT CAN WE USE TO CREATE SURFACE TEXTURE AND SHADE? Opaque white pen for highlights. Above all, keep your pencils sharp. 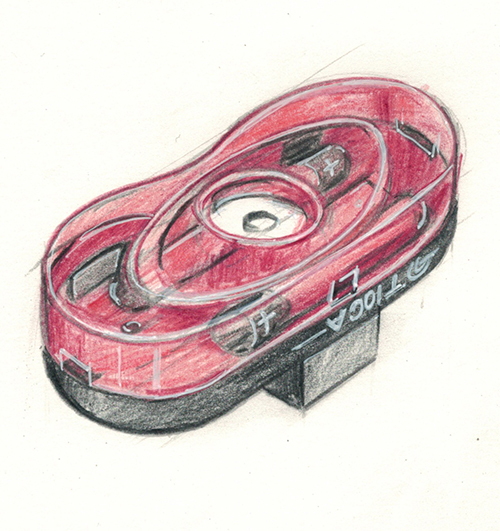 You will be surprised how often I sharpen my pencils when I'm rendering. This helps with crisp neat edges. Never ever say a Biro won't do! 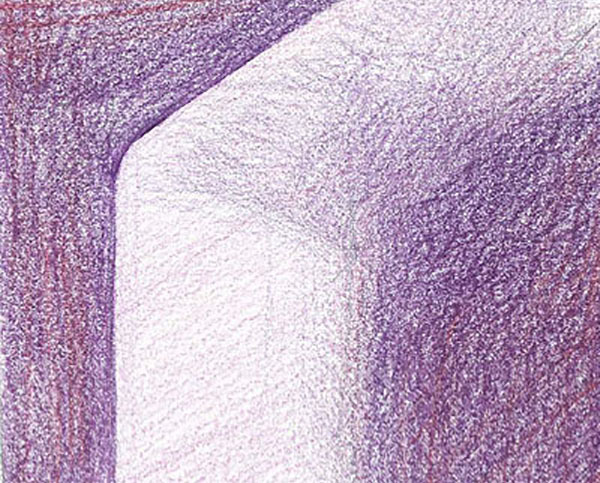 The humble ball point in everyone's pencil case is all you need for beautiful, sensitive tonal work. Use pen to create texture when representing old things. Here is a picture of a Ford V8 'Blitz' I used to own. Great, confident marker work. From "Sketching. Drawing techniques for product designers". Koos Eissen and Roselien Steur, Page One press. 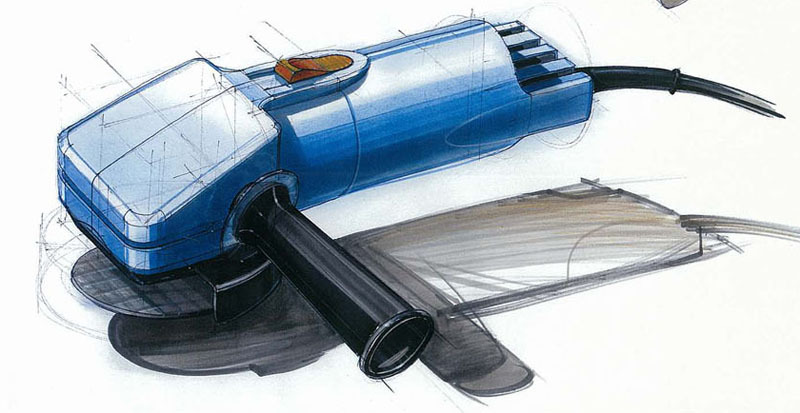 For advanced folio techniques, learn to use Copic markers. However, don't get too attached to them. They can not be used in an exam!